For anyone who does not like to have acupunture needles in the face, there is a perfect alternative. It is called Aqua-Facial which bills itself as ideal for all skin types and targets hyperpigmentation, oily/congested pores, fine lines, and wrinkles. Also, the AquaFacial resurfacing procedure thoroughly cares for your skin, providing cleansing, exfoliation, extractions, and hydration. The AquaFacial is a non-invasive, non-surgical procedure that delivers instant results with no discomfort or downtime. The procedure is immediately effective. Step 1: Cleansing and exfoliation. Our experienced acupuncturists/aestheticians use a small "deplaning" tool that opens up pores and sweeps the uppermost layer of makeup debris and dead skin cells away. It feels like a spinning toothbrush was being run over the face. Step 2: Acid peel. As most glycolic peels leave the skin stinging for a few minutes until they're washed off, the glycolic/salicylic acid peel is gentle enough that it only creates the faintest tingle. Step 3: Extractions. If you're the type of person who gets off on seeing what comes out of your clogged pores, this is the part of the treatment you'll love. Instead of performing manual extractions, our acupuncturists/aestheticians something rather elaborately called a vortex-extraction nozzle that acts as a vacuum. The best part is the cup at the base of the machine that shows exactly what was extracted. Usually it is more than one can expect. 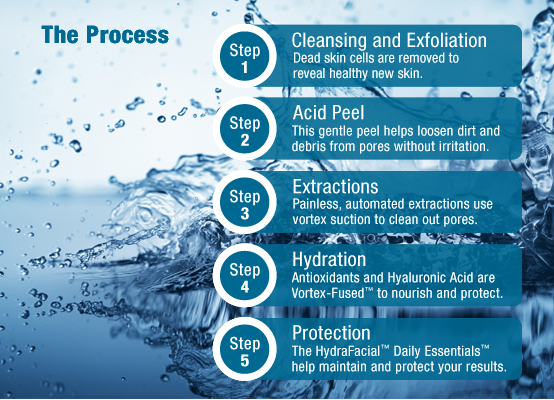 Step 4 and Step 5: Hydration and Serum application. These steps use the vortex-fusion tool, which infuses an antioxidant-and-collagen-rich serum into the skin to promote elasticity and hydration.